What does a small, select group of individually owned B&Bs and guesthouses, located in this unique town at the tip of Cape Cod, have in common? Besides offering the charms of a traditional Provincetown bed and breakfast, we each offer a range of luxurious lodging accommodations and amenities normally associated with top boutique hotels. As owners, we are also your hosts, and our welcome is genuine, warm, and personal. Although our houses vary in size and style, each enjoys an ever-growing number of returning guests who have come to relish the quality of accommodations and services we strive to offer. Our P-Town inns and guesthouses continue to receive the recognition and acclaim of major travel publications including The New York Times, Fodor’s, Out & About, Pink Choice, Frommer’s, Trip Advisor, booking.com, Zagat, Cape Cod Life, Cape Cod Travel Guide, and Yankee Magazine.We hope you will come to discover just what makes each of us so individually distinct and the perfect place to stay in Provincetown. 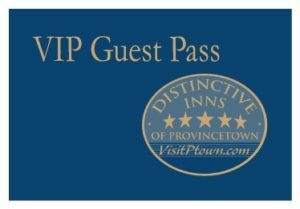 Stay with any of our distinctive Provincetown inns and receive a VIP Guest Pass card, valuable for discounts at select Provincetown retailers, galleries, & establishments. Ask your host for details! Every guest that checks into one of the Distinctive Inns of Provincetown receives a VIP Guest Pass Card that offers our guests discounts or gifts at participating merchants in Provincetown. No other inn or group of inns offers a program like this in Provincetown.